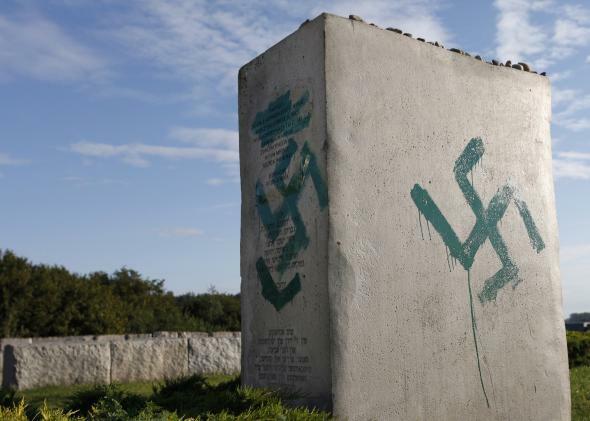 Swastikas defacing a monument that commemorated an anti-Jewish pogrom, Jedwabne, Poland, September 1, 2011. Lon and Emily are right. I shouldn’t have framed the FBI and ADL data as a rebuttal to the EJC. What the FBI and ADL data show is that anti-Semitic hate crimes in the U.S. have been declining and that the Kansas shooting is an outlier. These data don’t address trends in Europe or elsewhere. And the data in Europe are much more complicated. Over the 10-year period, the indices in France and Germany ended up in a lower range than where they began. The index in Sweden ended up in a higher range. The indices in Austria, Belgium, Ireland, and Slovakia went up and down. The index in the Czech Republic peaked in 2009 and has been falling since. Here’s a similar table from Russia, again suggesting a negative trend line. The top row, translated to English, counts victims of hate crimes (presumably all these crimes were anti-Semitic, since the report is titled, “Manifestations of anti-Semitism”). The bottom row counts victims of clearly anti-Semitic attacks. On balance, it appears to me that more of these countries show declines than show increases. But that’s subject to statistical argument, and it doesn’t change the fact that the trends in Europe aren’t as clear as the trend in the U.S. As the Ukraine and U.N. cases illustrate, anti-Semitism is sometimes hyped or manufactured for political advantage. And in the U.S., the Kansas shooting is an outlier. But in some countries, the rate of anti-Semitic incidents is holding steady or even increasing. Each country is different.